The three-year downward slide in Iowa farmland values appears to have stopped, at least temporarily, according to a survey released March 22 that showed a 0.9 percent increase in ag land values over the past six months. "It looks like the bleeding has stopped temporarily," says Kyle Hansen, a Realtor who heads the survey which is conducted by the Iowa Chapter of REALTORS Land Institute. 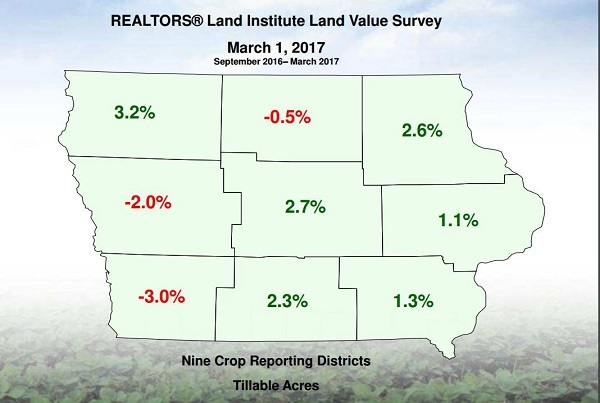 The survey of Realtors reflects their thoughts on the price of Iowa farmland over the past six months. It follows a 3.7 percent drop in land values the previous six months, so the total for the last year is still a decline of 2.8 percent. The average price for tillable farmland in the state as of March 1 was about $6,545 per acre, Hansen says. That compares to $8,690 in the March 2013 survey. Values rose slightly for about six months after that and then began dropping in the fall of 2013, according to the survey. Today's market is more of a "flatline, sideways type of trend," Hansen says. Prices are going up as much as they are holding steady. That reflects the fact that agricultural exports remain strong and interest rates remain low, although there are some concerns about both of those trends. More important, Hansen says, is the fact that very little land is actually hitting the market. Because of that, farmers who have held onto their money for the past several years are jumping into the market if the opportunity arises. Roger Johnson, a Realtor with Farmers National Company in Cedar Falls, says this is the most competition for farmland he has seen in a long time. Realtors also say there is strong investor interest in farmland and that yields have been good in many parts of Iowa in the past year. On the downside, they say low commodity prices, an uptick in interest rates, low net farm revenue and some government uncertainty are all holding prices of farmland down. �2 percent down for West Central Iowa. �$2,291 for timber (compared to $2,276 in September). The future is difficult to predict, Hansen says, but it is probably "going to be very dependent on production and crop prices." Right now, he says, the market is volatile and appears to be in a steady or sideways pattern. "Land values appear to be taking a breath," he says.